Planning an anniversary party for your parents or grandparents? This is the perfect addition to the party! 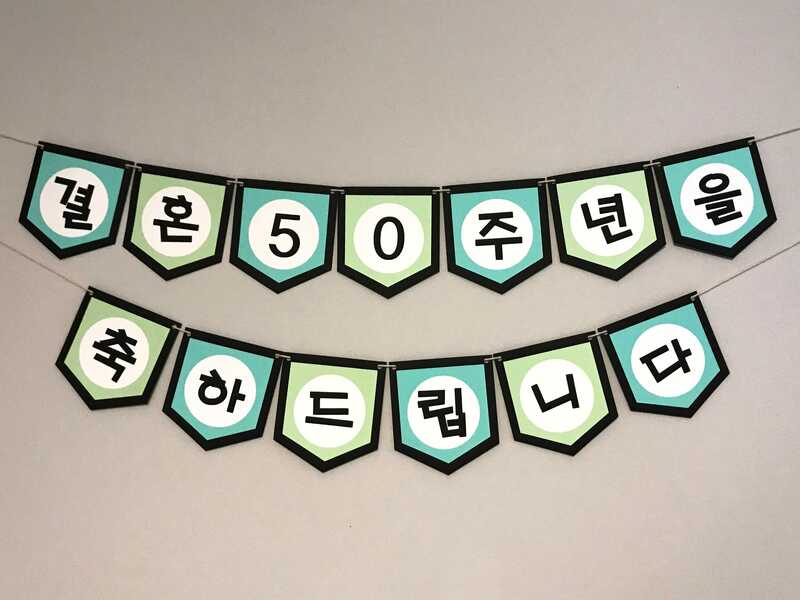 Handmade Korean (formal) happy 50th anniversary banner - 결혼 50주년을 축하드립니다 – 13 panels at 5″ x 5½″ with white string. Please name 1 color of your choice for the background (black in this picture) PLUS 2-4 colors of your choice for the inner background (mint and teal in this picture). You can also pick a color for the characters. If this is not specified the characters will come as shown (black characters on white circle). Please specify the design. Do you want the rounded bottom or the pointed down design? If you have any questions feel free to message me. It will take me about 1-3 business days to create this. Please let me know if it needs to be send with expedited shipping (which will cost extra). Otherwise it will be shipped with standard shipping and will arrive in 2-3 business days. Outside of the USA it will take 5-10 business days. Again, let me know if you need it quicker. Wonderful, beautiful, and arrived quickly. Thank you, Nativehaus!